Several months have passed since the expedition of Burke and Wills disappeared into the desert their whereabouts remain a mystery. Now, a search party has assembled to rescue them. Meanwhile, two other men are wandering lost in the outback: one on the verge of reaching safety; the other, broken and trapped at the heart of the continent with an Aboriginal tribe as his only hope of survival. Back in the city an actress, star of the stage in Melbourne and Sydney, longs for the return of Burke and Wills for personal reasons that will only gradually become apparent. 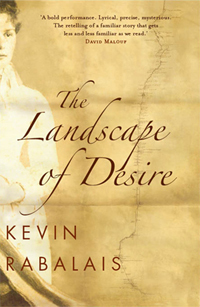 Set in rapidly changing yet still unknown Australia and loosely based on the ill-fated Burke and Wills Expedition, The Landscape of Desire is a stunning debut novel that re-imagines the lives of the key players in this historic event and weaves them into a narrative that spans continents and decades. Written in mesmerizing prose, with echoes of Heart of Darkness and The English Patient, The Landscape of Desire slowly reveals its own secrets about love and identity, desire and death. Kevin Rabalais teases with the possibility of a great Australian novel but has failed to pull it off. The obsessive men who set out in search of the secrets of Australia's harsh interior is one of the epic stories in our history yet one inadequately explored in our literature. Perhaps the only great work to deal with the topic is Patrick White's Voss, which was loosely based on the enigmatic Ludwig Leichhardt. As such, I was quite excited by the prospect of Landscape of Desire, which is based on the famous fatal mission of Burke and Wills into the interior that started from Melbourne in 1860. The beginning of the novel, with its atmospheric evocations of the lives of the protagonists, seemed to confirm this promise. I was thinking that perhaps it takes a replanted American (Rabalais is originally from Louisiana but now lives in Melbourne) to revivify the inner states of these men who went in search of the Australian frontier. By the end of it, however, I was disappointed because I wanted this book's ambition to have paid off. One problem is the structure. To compensate for the known trajectory of the plot, Rabalais has given us a multi-perspective narrative that encompasses the before, during and after of the tragic mission. Although the narration is in the third person, the book is cut up into many sections mediated through several characters: Burke; Wills; John King (the only survivor); William Brahe, who waited for them at Cooper's Creek; Alfred Howitt, who rescued King; and Julia Matthews, the young actress with whom Burke was infatuated. This is a tactic often used to manufacture suspense in a story, or to build understanding of a particular event (William Faulkner's As I Lay Dying is a masterful example of this). But the feeling here is of too much jumping around, as if you were reading a series of vignettes organised around a well-known moment. Landscape Of Desire doesn't cohere sufficiently to provide the holistic illusion from which much of the pleasure and resonance of reading fiction is generated. Its energy dissipates rather than collects. This mightn't be such a problem if we were able to live and breathe with the characters. However, the conscious artfulness of the authorial voice cuts us off from them even as it tells us what they are thinking. Rabelais writes well but inappositely: his lyricism is over-egged and the novel's monotexturality of voice clashes with its multiplicity of perspectives. When he did get into the skin of his characters, my interest pricked up immediately, but unfortunately this was not sustained. Reading a novel is like allowing yourself to be hypnotised. Patrick White's Voss is a magnificent and engrossing depiction of an obsessional enterprise. One of the reasons why it works is that he has taken the character of the explorer Leichhardt and reimagined him as Johann Voss to suit his broader purposes. Rabalais might have been wise to do the same, since he takes liberties with the history without changing the names. Sometimes they are small things. John King, for instance talks of reaching the coast, when they only reached the mangroves on the estuary of the Flinders River. He also talks of John King becoming an old man, when he died at 34. There are others. Perhaps the largest liberty is his idea that Wills was also romantically involved with Julia Matthews. There is nothing necessarily wrong with historical inaccuracy in fiction. Yet, in this case, the small departures from the facts serve to erode trust in the narrative. The bigger departure is more interesting, intimating the possibility of a love triangle and tensions between the two men on the expedition. Yet Rabalais doesn't do enough with it. There are things to like about Landscape Of Desire and it is clear its author can write. Yet as a novel, it doesn't work. Novels need to be compelling if the reader is going to turn the pages and lyrical prose is not enough. Rabalais has teased us with the possibility of a great Australian novel but has failed to pull it off.